Fixing Australia’s power pricing and supply calamity means slashing subsidies to wind and solar: not in 2020, not in 2030, but right now. For the wayward and confused, it’s always important to remember that a straight line is the shortest, and often the safest, route home. Australia’s self-inflicted energy crisis started out with massive subsidies to intermittent wind and solar so, as a matter of simple logic, arresting the harm and undoing the damage means bringing those subsidies to an abrupt end. Henry Ergas is an economist who has had plenty to say about Australia’s renewable energy disaster. Always eloquent and insightful, here he is again. Like all the great tragedies, the story of our electricity market’s destruction is ultimately very simple. Nor is it hard to identify the fatal flaw that has propelled it towards outcomes that are catastrophic for consumers and the broader economy. But with the Australian Competition & Consumer Commission’s electricity report urging yet more government intervention, don’t expect the tendency of our governments to pile mistake on mistake, compounding distortions rather than unwinding them, to disappear anytime soon. To say that isn’t to belittle the report’s considerable merits, not least the masses of data it makes available. Yet it is hard to read it without being reminded of Bar­bara W. Tuchman’s The March of Folly. “Mankind, it seems, makes a poorer performance of government than of almost any other human activity,” she writes in her masterly survey of policy disasters, first published in 1984. Yes, as the signs of trouble accumulate, “there is always freedom of choice to change”; but time after time, the “ambition, anxiety, status-seeking and face-saving” of “wooden-headed” rulers ensure that “to recognise error, to cut losses, to alter course, is the most repugnant option in government”. Instead, governments, “whether the British leaders who lost America or the five (US) presidents who pursued an inherently flawed policy in Vietnam”, escalate their commitment to ill-conceived courses of action, deluding themselves by tinkering with strategies that failed before and are doomed to fail again. So too here. For sure, the initial error, made in the early 2000s — when the Queensland and NSW Labor governments, panicked by blackouts in Sydney and Brisbane, decided to significantly increase their network investment — had nothing to do with reducing greenhouse emissions. 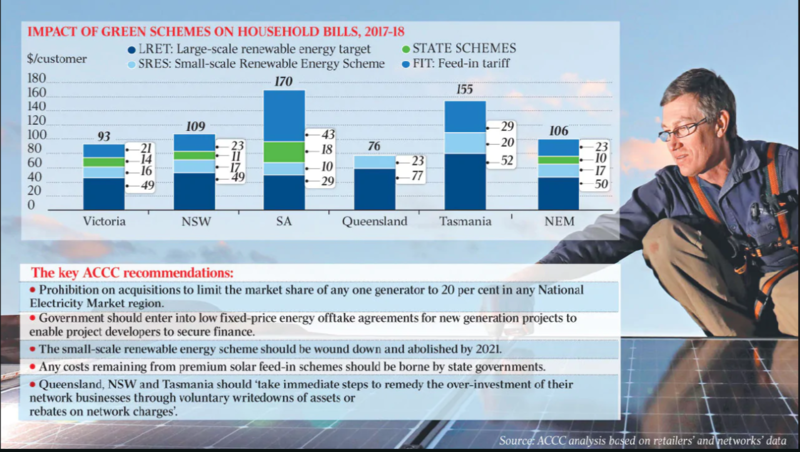 But if the costs of that error proved so high, it was because those governments and others then introduced huge subsidies for solar panels, slashing network demand just as the additional ­capacity came on stream. With the higher network costs, and the cost of the solar subsidies, having to be recouped from a smaller base of demand, retail electricity prices — which had fallen in real terms during the 1990s — began to climb. Faced with the rising prices, one might have expected governments to back down. However, after winning office by promising to ease the cost-of-living pressures on households, the Rudd Labor government moved in 2009 to dramatically increase the renewable energy target, which the Howard government had introduced on a modest scale in 2001. As the stiffer target came into effect, subsidies to renewables skyrocketed, costing consumers a cumulative total of nearly $20 billion at today’s prices. With those subsidies allowing renewables to operate at low or negative wholesale prices, prices in the National Electricity Market collapsed, making much of the older coal-fired capacity unprofitable and accelerating its scrapping. By 2012-13, it was apparent that shutting those plants would cause competition to shrivel, sending household electricity bills through the roof. Regulators therefore should have been screaming for the subsidies to be eliminated, allowing the market to function as it had in the 90s. Instead, they sought ever greater powers to intervene, while arguing that there was little reason to worry about the deteriorating supply-demand balance. Comforted by those assurances, the Coalition government, with support from the opposition, committed in 2015 that the RET would remain in operation until at least 2030; once that commitment had been given, the flood of investment in renewables became a torrent, precipitating the closure of the Hazelwood power station in March last year. Hazelwood accounted for 5 per cent of all generation capacity. Moreover, the competitive constraint it provided helped cap ­prices in Victoria and NSW. Once it shut, prices, which 20 years ago were among the world’s lowest, soared to levels that were not only three times those in the US but substantially above those in Europe, which lacks our abundant, high-quality coal. And as prices rose, a massive transfer of wealth occurred, from low-income households that could not afford rooftop solar panels to investors in renewables, who luxuriated in rates of return about 50 per cent greater than those earned by their US counterparts. None of that will change if the ACCC has its way. But what will happen is that a market already drowning in regulation will become even more heavily managed. And by increasing the market’s byzantine complexity, and heaping new subsidies on old ones, what little ability market participants still have to predict the rules under which they operate will entirely disappear. That those changes would come on top of others — including the national energy guarantee and the exemption of regulatory decisions from all forms of independent review — that enhance regulators’ discretionary powers merely adds to the concerns. So does the fact several of the ACCC’s recommendations are extremely poorly thought through. How, for example, could anyone seriously believe that shifting costs from consumers to taxpayers (as the ACCC recommends in respect of network charges) would make them less burdensome from the community’s point of view? And how could the ACCC bring itself to recommend — on the basis of what it describes as “confidential feedback from a number of market participants”, some of whom had “insufficient creditworthiness to finance projects” — that taxpayers should guarantee the revenue stream to new, small-scale generators? These are, at best, Band-Aid proposals — and expensive and inefficient ones at that. 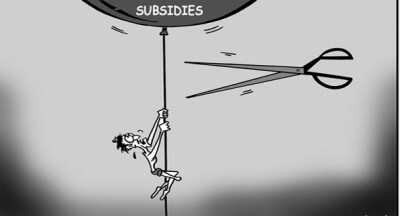 What we need is the courage to end immediately the subsidies to renewables that have brought our power system to its knees and inflicted so much harm on consumers. Tragedy, said Aristotle, is “that which reveals what moral choice is like”. After a disastrous decade, that choice is stark. It is a tragedy that the ACCC could not bring itself to make it. No action should be taken as with all government meddling the end result as we are seeing now is the Australian electricity generation and distribution system being bought to it’s knees by unbelievably crazy federal government legislation written by a bunch of failed lawyers and their had a real job advisors.. The whole system should be allowed to collapse and then bring in the people who built the original coal fired generation which was cheap and reliable. The first winter the Victorians and New South Wales human sheep live through without hot water or electricity to even pump the water and no electricity to cook their evening meal might just bring a bit of reality back into the argument that has been hijacked by the greatest bunch of Green climate change believing fools that the world has ever seen. No one seems to be worrying about Recommendation 14-that mandates smart meters and cost-reflective tariffs that they assure us will raise electricity prices sky high for those of us who have the temerity to have airconditioning and swimming pools. Grattan Institute has decided that we’re all freeloading on those who haven’t them because the cost of electricity for them is paid in the network costs and not reflected in our bills. I don‘t trust that because the Grattan Institute is a CAGW true believer org and would have us all corralled …remotely controlled …rationed….and anyway something very big is reflected in OUR electricity bill. Grattan finds that we who have subsidies siphoned out of our pockets into the coffers of Turnbull’s uber-rich carpetbaggers must now pay virtual fines …for our measly bit of aircon or curtail that down to nothing anfd fry or freeze…because those without aircon are cross-subsidising us. If that’s cross-subsidizing there’s cross-subsidizing going on 24/7 across the economy…in education at ALL levels…health…food…transport etc etc. It’s just cover IMO created to disguise the fact that electricity prices are going nowhere but up ANYWAY…stratospherically and catastrophically….and they’re MEANT TO. It’s a signal too…about all the inevitable coercion to come…to make us surrender control in every way they can think of ..smart meters…control of appliances remotely [as described in this chapter of the report…VISIBILITY by THEM of our home use of electricity…to coerce us to embrace demand response …and ‘interruptibility’ as they have across California along with rolling outages….and before long rooftop solar and ‘ORCHESTRATED’ VPPS will be compulsory because once the penetration of that gets to a certain stage there are not enough of us left to pay for the grid …so the grid collapses….foretold by the former AEMO boss just before he died and shortly before Turnbull rushed to ratify PARIS. And I disagree with Henry Ergas. It was TURNBULL who started the subsidy rush …the CULT was complaining about the terrible Abbott-induced slump before Turnbull knifed Abbott and stole government….in order to do the UN’s bidding. They don’t seem to have a plan for the grid collapse …and yet they’re planning to spend billions extending the grid …billions that we consumers will ALL pay for …expressly NOT the uber-rich weather-dependent intermittents generators it’s in support of…JUST US. So we have to pay through the nose for intermittents we don’t want plus all the props they must have to make them useful at all… to make Infigen et al and State Grid Corporation of China rich as Croesus…but Grattan Institute and ACCC tell us we’re freeloading if we have a bit of aircon….and must PAY UP. Never has Australia had such a destructive and dangerous wilful idiot clown of a PM…a creature whose Narcissism tells him that making Australia roadkill for the hoax of the millennium is just the price that must be paid for the kudos HE expects to get from the filthy rich global Socialists…and his comrades at the giant vampire squid and fellow finance behemoth Bloomberg….as reward for KILLING AUSTRALIA. There is absolutely no doubt that the first paragraph of this post by STT is 100% correct. Unless the subsidies stop now it is impossible for the electricity chaos in the NEM to stop and its impossible for prices to come down – that this witless government cannot work that out is mind boggling and no amount of passing the buck and threatening others will fix it so long as the subsidies and mandated renewable energy targets remain. Well said Henry Ergas. To protect the treasured renewable industry, yet at the same time, ameliorate to some extent the approaching east coast blackouts, in my view Team Turnbull is most likely to subsidise “select” fossil fuel generation projects. In Team Turnbull’s view, it will get them through the next election by helping to “drive down prices”, meet the recommendations of the ACCC and importantly; balance the perceived interests of the voters. It’ll just be more of the same. The taxpayer will be on the hook for an even greater commitment. They can’t stop digging. Team Turnbull needs to be removed from office. If the Libs/Nats can’t do it, then the voter will. Politicians have screwed up us, their nations and their reputations in the Great Green Scams/misunderstandings but, so as to salve their reputations, should accept your advice or, in your case, bring back Tony Abbott.